Welcome to All Sensors “Put the Pressure on Us” blog. This blog brings out pressure sensor aspects in a variety of applications inspired by headlines, consumer and industry requirements, market research, government activities and you. In this blog we’ll be discussing pressure sensors used in canals. While the Panama Canal is among the most famous canals in the world, several lock systems exist in the continental U.S. including on the Mississippi River, Saint Lawrence Seaway, the Soo Locks at Sault Ste. Marie, Michigan and others. In addition, dams also control the flow of water along many rivers. 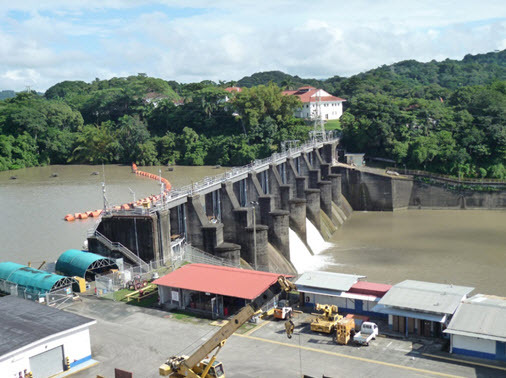 At the Panama Canal, 265 meteorological and 52 hydrometric stations were installed to measure meteorological parameters of pressure, temperature, extreme temperature, humidity, precipitation (quantity and intensity), wind (speed and direction), evaporation, soil temperature, insolation and solar radiation. With the pressure measurements, the hydrometric stations monitor the rivers and lakes levels continuously. Modern pressure sensors allow even more measurements to be made and communicated to remote monitoring locations for a variety of purposes. The dam on Miraflores Lake at the Panama Canal. Welcome to All Sensors “Put the Pressure on Us” blog. This blog brings out pressure sensor aspects in a variety of applications inspired by headlines, consumer and industry requirements, market research, government activities and you. In this blog we’ll be discussing pressure sensors used in mattresses. If Papa and Mama bear had a Durmet Smarttress mattress, they would have received a message on their cell phones regarding the unauthorized usage of their beds. Developed to provide instant feedback regarding motion of the mattress, the system could even report kids jumping on the bed. The mattress employs an array of 24 ultrasonic sensors to detect activity. Algorithms analyze the motion on the mattress and the system sends alerts to the mattress owner’s cell phone. Arrays of pressure and other sensors have been used for years to monitor activity and the weight distribution of patents to avoid bedsores. Typically, maximum measurements (around 13.2 kPa or 1.91 PSI) allow a 2 PSI pressure sensor to be used in several isolated air-filled compartments in a mattress to alert a caregiver. More recently, similar measurements combined with control electronics have provided increased comfort by using the measurements to adjust the bed (firmer or softer in various areas) for healthy sleepers. The Smarttress takes an Internet of Things (IoT) approach to sensing, analyzing and communicating data to add a new application. Sensor embedded in the Durmet Smarttress mattress detect motion. Source: Durmet.